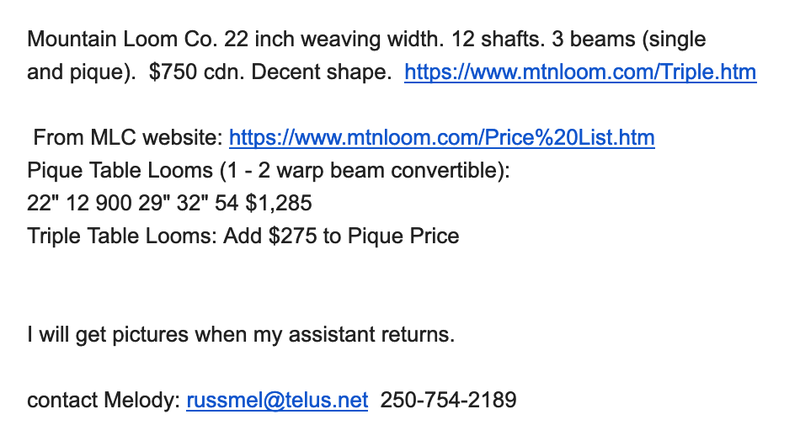 This is the Mid Island Weavers and Spinners (and other fibre enthusiasts) blog page. The group meets the first Wednesday of the month during the fall/winter/spring (September through to June). Meetings are held in the hall of St. Paul's Chruch downtown Nanaimo (across from the Dorchester Hotel - the entrance is on the other side of the church at 100 Chapel St, across the street from the new condos). 7:00 pm. 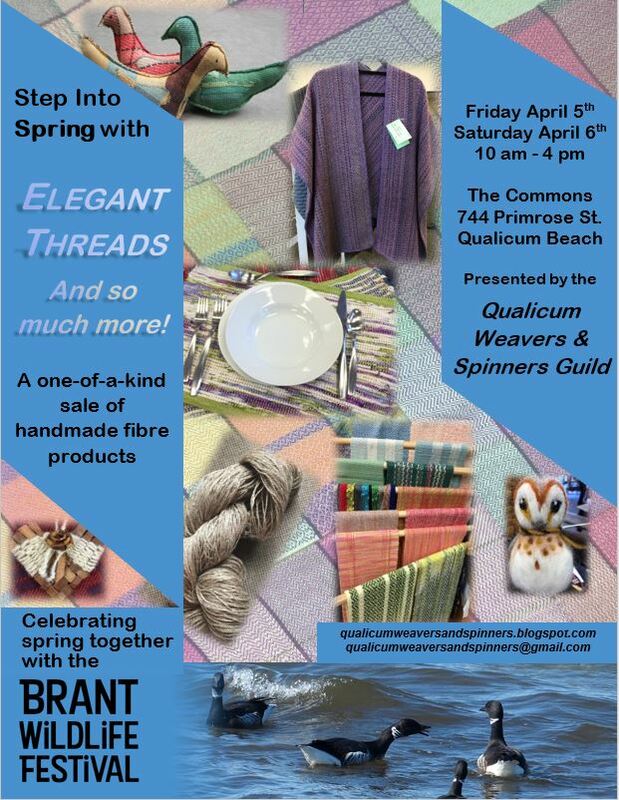 Guests are welcome to come...bring your knitting, spinning wheel or other fibre addictions. Meetings usually consist of 5 minutes of business, show and tell (bring something), tea and cookies, and some sort of workshop, seminar or talk where you will learn something fibry and interesting. with thanks to Kathy McDonald for this. 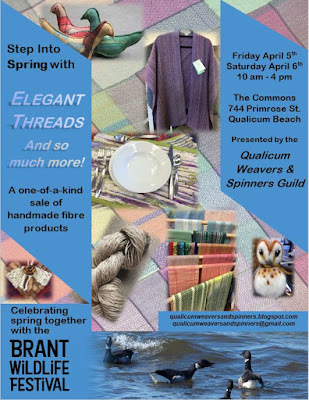 are holding a spring show and sale featuring handwoven clothing, household linens, knitted and felted items in natural fibres. April 5 - 6th from 10 am to 4 pm. 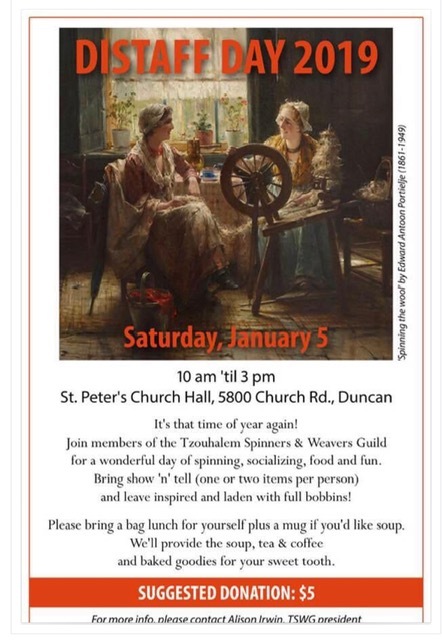 Demonstrations of weaving and spinning, a silent auction of member's handiwork. Free admission to all members of the public and is wheel chair friendly. The monthly guild meetings will be held in the Big Meeting room of the Harbourfront Branch of the Library for Feb – June, 6pm – 8pm. Concern that with the current size of our membership and low annual fees most of our money was going to rent for a facility, St Paul’s Anglican Church, that does not offer us any advantages other than space and time (no closing time). We also need to increase our visibility in the community to attract new members, and to be able to plan workshops. I contacted the Harbourfront Branch of the library and received a very positive response. Steinunn Benjaminssonn, Customer Services Librarian, Adult Services , asked if she could come to the meeting in January. Yes, of course. Major Concern – reason for the trial run. Raised by several folk at the meeting: If we give up the Church meeting room we may not be able to get it back. Solution suggested by Liz H-K. We do a trial run. We pay the rent for the Church for the first half of the year (we normally pay in two parts) but we meet in the library until the summer. Long very active discussion and debate with the 9 members in attendance with Steinunn Benjaminssonn. St Paul’s has been the venue for many years and prior to the renovation was ideal. However, with loss of the storage things have changed. The library cannot solve the storage issue. The location in the Old Town is good. This is true for the Church and the Harbour Front Library. The library would not be charging us rent. The Church $600 a year. We would have the use of the Large Meeting Room upstairs; tea and coffee can be made. Potlucks can be held in the room. Library: to get two hours: 6pm-8pm the library closes at 8pm. Bookings: The meeting room can be booked for three months at a time. We would not need the room the summer (July and August). The Large Meeting room has the ability to project from a computer to a screen and has recently acquired an Apple TV projector addition. Parking is free after 5pm in the Bastion Street Parkade and is a walkable distance from the library via Skinner St. Please share the following information with your membership. 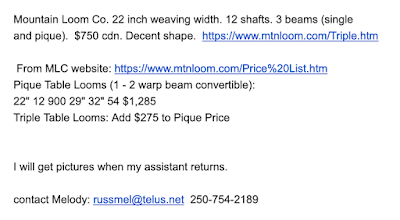 Bradley Thursday Spinners | Read here to find out what is happening within the spinning/weaving/knitting/crafting world! 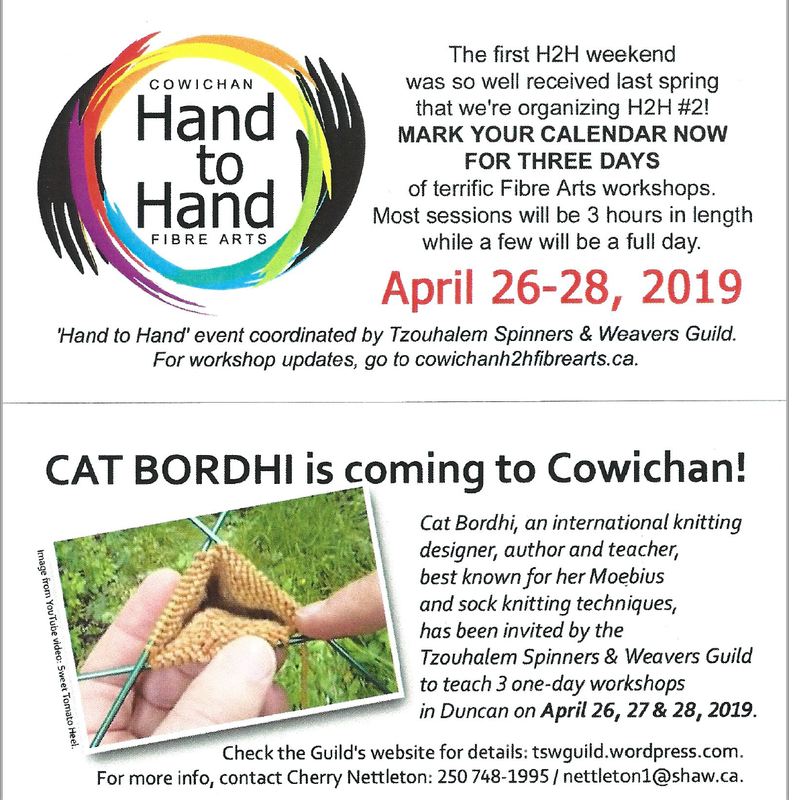 Blog | Victoria Handweavers & Spinners Guild | Weaving and spinning in Victoria, BC, Canada since 1934.